Klebsiella pneumoniae is a Gram-negative, ubiquitous bacterium capable of causing severe nosocomial infections in individuals with impaired immune system. Emerging multi-drug resistant strains of this species and particularly carbapenem-resistant strains pose an urgent threat to public health. The lipopolysaccharide (LPS) O-antigen is the main surface antigen. It contributes to the virulence of this species and determines the O-serotype of K. pneumoniae isolates. Among the nine main O-serotypes of K. pneumoniae, O1-and O2-type pathogens are causative agents of over 50% of all infections. Serotype O1, the most common O-serotype, expresses complex LPS consisting of D-galactan-I (a polymer built of → 3)-β-D-Galf-(1 → 3)-α-D-Galp-(1 → repeating units) capped by D-galactan-II (built of [ → 3)-α-D-Galp-(1 → 3)-β-D-Galp-(1 →] repeating units). Galactan-I is present as the sole polymer in O2 serotype. Recently, in case of serotype O2, conversion of galactan-I to galactan-III (→ 3)-β-D-Galf-(1 → 3)-[α-D-Galp-(1 → 4)]-α-D-Galp-(1 →) was reported. Substitution of → 3)-α-D-Galp by a branching terminal α-D-Galp was dependent on the presence of the gmlABC operon and had a major impact on the antigenicity of the galactan polymer. Genetic analysis indicated that 40% of the O1 clinical isolates also carry the gmlABC locus; therefore we aimed to characterize the corresponding phenotype of LPS O-antigens. The presence of galactan-III among O1 strains was proven using galactan-III-specific monoclonal antibodies and confirmed by structural analyses performed using sugar and methylation analysis as well as classical and high-resolution magic angle spinning NMR spectroscopy. By using an isogenic mutant pair, we demonstrated that galactan-III expression was dependent on the presence of glycosyltransferases encoded by gmlABC, as was shown previously for the O2 serotype. Furthermore, the galactan-II structures in O1gml+ strains remained unaffected corroborating no functional interactions between the biosynthesis of galactan-III and galactan-II polymers. Klebsiella pneumoniae is a Gram-negative, ubiquitous bacterium that is a common colonizer of the human gastrointestinal tract, skin, and the upper airways. It can cause severe nosocomial infections, bloodstream infections, pneumonia, meningitis, and sepsis (Podschun and Ullmann, 1998) mainly in individuals with impaired immune system (e.g., neonates, elderly, immunosuppressed patients) (Gupta et al., 2003). Klebsiella infections represent a frequent problem in intensive care units that are associated with high mortality rate (Podschun and Ullmann, 1998). A serious threat to global public health is the spread of carbapenem-resistant K. pneumoniae and the emergence of resistance to last resort antibiotics (Centers for Disease Control and Prevention, 2013; Lee et al., 2016). High mortality rates among patients with bacteremia caused by carbapenem-resistant K. pneumoniae are attributed to the limited availability of effective antibiotics, restricted to only a few drugs, such as colistin, polymyxin B, fosfomycin, tigecycline, and selected aminoglycosides as well as their combinations (Lee et al., 2016; Munoz-Price et al., 2017). K. pneumoniae typically expresses both, lipopolysaccharide (LPS) and capsular polysaccharide (CPS, K-antigen), which contribute to the virulence of this species. LPS is a main surface antigen built of the O-specific polysaccharide (O-PS) containing different numbers of oligosaccharide repeating units (RU), core oligosaccharide and lipid A. O-PS structures define O-serotypes of Klebsiella strains. In contrast to most Gram-negative bacteria, variability of K. pneumoniae O-antigens is currently limited to 9 major O-serotypes: O1, O2, O2ac, O3, O4, O5, O7, O8, O12 (Hansen et al., 1999) and a few subtypes within these serogroups (Kelly and Whitfield, 1996). However, the occurrence of modified or novel O-antigen structures has been forecasted recently (Follador et al., 2016; Szijarto et al., 2016). Since O-antigens are far less variable than CPS, Klebsiella LPS O-antigens have been suggested as potential target antigens for immunotherapy as an alternative to antibiotic treatment (Rukavina et al., 1997; Trautmann et al., 1997, 2004; Hsieh et al., 2014; Follador et al., 2016; Szijarto et al., 2016). According to published epidemiological data, O1 and O2 serotypes are causative agents of 50–68% of all Klebsiella infections (Trautmann et al., 1997, 2004; Hansen et al., 1999; Follador et al., 2016). O1 and O2 strains express LPS containing O-PS built of homopolymers of galactose (galactans, gal). O1 serotype expresses D-galactan-I (gal-I) built of → 3)-β-D-Galf-(1 → 3)-α-D-Galp-(1 → as the RU and capped by a polymer of an antigenically different galactose disaccharide [ → 3)-α-D-Galp-(1 → 3)-β-D-Galp-(1 →] termed as D-galactan-II (gal-II) (Whitfield et al., 1991; Kol et al., 1992). On the other hand, O2 consists of gal-I only (Whitfield et al., 1992). For both serotypes, the gal-I synthesis is encoded by the his linked rfb (wb) operon (Clarke and Whitfield, 1992; Kelly et al., 1993; Kelly and Whitfield, 1996). Additionally, O1 strains carry a genetically unlinked locus (wbbYZ) that is responsible for the synthesis of D-gal-II (Hsieh et al., 2014). It was shown previously for the O2 serotype that D-gal-I can be decorated by stoichiometric and non-stoichiometric addition of O-acetyl or terminal D-galactose (Kelly et al., 1995). Recent studies revealed the frequent occurrence of gal-I backbone RU decorated by the terminal α-D-Galp residue, termed as D-galactan-III (gal-III), within the O2 serogroup and the genetic background for this modification has been identified (Szijarto et al., 2016). It was shown that conversion of gal-I to gal-III is encoded by gmlABC, which is carried adjacent to the gal-I-encoding rfb (wb) operon. Moreover, it was demonstrated that ~40% of the O1 clinical isolates carry the gmlABC genes (Szijarto et al., 2016) suggesting the expression of gal-III also within the O1 serotype. In this study we intend to validate the predicted gal-I/gal-III conversion in O1 strains using serological methods and structural analysis of O-specific polysaccharides isolated from clinical isolates as well as from isogenic mutants. The presented data provide further insight into structural modifications of K. pneumoniae LPS that may influence binding of therapeutic or diagnostic antibodies. K. pneumoniae O1 (Kp4, Kp16, Kp24, Kp69, Kp71, Kp75, Kp76, Kp88, Kp111) and O2 (Kp30) isolates used in this study were obtained from clinical specimens. Prototype strains PCM-27 (O2 gml+) and PCM-11 (O3:K11) were purchased from the Polish Collection of Microorganisms (PCM, Hirszfeld Institute of Immunology and Experimental Therapy, Polish Academy of Sciences, Wroclaw, Poland). Bacteria were grown on Trypcase Soy Agar plates (BioMérieux) and Luria-Bertani (LB) broth. For large scale LPS preparation, strains were cultured in LB broth in a 10 L fermenter (37°C, 200 rpm, aeration of 5 L/min), killed with 0.5% phenol for 2 h at 60°C, washed with water and freeze-dried. For molecular cloning and cultivation of trans-complemented strains (Kp4/pKP100 and Kp4/pSU2718), selective medium supplemented with chloramphenicol (20 μg/ml) was used. pKP100 carries gmlABC cloned into expression vector pSU2718 (Martinez et al., 1988) as described elsewhere (Szijarto et al., 2016). The clinical isolate Kp4 (O1gml–) was transformed by electroporation with either the empty cloning vector or with the recombinant plasmid. LPS from K. pneumoniae strains Kp4 and Kp24 and recombinant mutants of Kp4 were isolated by the hot phenol/water method and purified by dialysis and ultracentrifugation as described elsewhere (Lukasiewicz et al., 2010) including a glass-wool filtration step before ultracentrifugation (Szijarto et al., 2016). O-PS was isolated as previously described (Szijarto et al., 2014) with slight modification (Szijarto et al., 2016). Briefly, poly- and oligosaccharides released by mild acid hydrolysis were ultracentrifuged to remove remains of capsular polysaccharides (6 h, 105,000 × g, 4°C). The obtained supernatants were freeze-dried and fractionated on Bio-Gel P-10 (200–400 mesh) as previously described (Szijarto et al., 2016). Six fractions were obtained and checked by 1H NMR spectroscopy. Fractions 1a–1c were identified as O-PS, fraction 2 as shorter O-PS, fraction 3 as core oligosaccharides, and fraction 4 as degradation products of mild acid hydrolysis of labile regions of core oligosaccharide (Szijarto et al., 2016). LPS of clinical isolates were purified with a commercial kit (LPS extraction kit; Intron). Immunoblotting was performed as described previously (Szijarto et al., 2014). Briefly, purified LPS was blotted onto polyvinylidene difluoride (PVDF) membranes and subsequently incubated with 0.1 or 1 μg/ml monoclonal antibodies (mAb) in TBS containing 0.1% BSA (HyClone) and 0.05% Tween 20 (Fisher Scientific). Murine mAbs 5C10, 1F11, and 5A4, specific to gal-II, gal-I, and gal-III, respectively, were generated by hybridoma technology as described previously (Szijarto et al., 2016). 5C10 and 5A4 were expressed as mouse-human chimeric mAb, and 1F11 was used as murine mAb. Binding of mAbs was detected by horseradish peroxidase-conjugated goat F(ab)2 anti-mouse or anti-human IgG (Southern Biotech) at 1:40,000 dilution in TBS with 0.1% BSA and 0.05% Tween 20. Membranes were developed with ECL Prime Western blotting reagent (GE Healthcare). Methylation and sugar analyses of O-PS were performed as described earlier (Szijarto et al., 2014) according to the method described by Ciucanu and Kerek (1984). All NMR spectra were obtained using an Avance III 600 MHz (Bruker BioSpin, Germany) spectrometer equipped with a 5 mm QCI cryoprobe with z-gradients (O-PS). NMR spectra of isolated O-PSs were obtained for 2H2O solutions at 25°C using acetone as an internal reference (δH/δC 2.225/31.05 ppm), processed and analyzed as described earlier (Szijarto et al., 2014). Briefly, signals were assigned based on 1D 1H NMR spectra and 2D experiments COSY, clean-TOCSY, NOESY, HMBC, HSQC-DEPT, and HSQC-TOCSY. The excitation sculpting pulse sequence was used for suppression of water resonances. The mixing times in clean-TOCSY experiments were 30, 60, and 100 ms. The delay time in HMBC was 60 ms, and the mixing time for NOESY was 200 ms. The processed spectra were assigned with the use of SPARKY (Goddard and Kneller, 2001). NMR spectra of LPS (Kp4/pSU2718 mutant) were obtained using 1H, 13C high-resolution magic angle spinning (HR-MAS) probe with z-gradients at the magic angle. LPS (3–4 mg) was suspended in 2H2O and placed into the ZrO2 rotor. HR-MAS NMR experiments were carried out at a spin rate of 4 kHz at 30°C (the measured temperature of the bearing air used for sample spinning). One-dimensional spectra of LPS were acquired with a Carr-Purcell-Meiboom-Gill, CPMG, 90°–(τ−180°−τ)n-acquisition pulse sequence (total delay time 1.2 ms) as T2-filter to remove the broad signals from lipids (Jachymek et al., 1999). LPS was purified from 8 K. pneumoniae O1 isolates (4 isolates of respective gml+ and gml– genotypes) (Figure 1). All strains investigated here were confirmed to belong to O1 serogroup by reactivity with the gal-II specific mAb 5C10 (Figure 1A). Additionally, isolated LPS samples were tested for reactivity with gal-I (mAb 1F11) and gal-III (mAb 5A4) specific mAbs in immunoblots (Figures 1B,C). LPS from gml– strains reacted with 1F11 but showed no binding by 5A4 mAb. On the other hand LPS samples from gml+ strains were recognized by 5A4 and showed varying degrees of binding to 1F11 (highlighted by arrows in Figure 1B). The retained reactivity to 1F11 in gml+ strains confirms non-stoichiometric conversion of gal-I RU to gal-III RU, as proven before in case of O2 strains (Szijarto et al., 2016). Figure 1. Immunoblotting of K. pneumoniae O1 strains with different gml genotypes. Separated LPS molecules reacted with monoclonal antibodies specific to different galactan structures as shown: (A) anti-gal-II mAb 5C10, (B) anti-gal-I mAb 1F11, (C) anti-gal-III mAb 5A4. Lanes description: 1, Kp30 (O2gml–), 2, PCM-27 (O2gml+), 3, Kp16 (O1gml–), 4, Kp69 (O1gml–), 5, Kp76 (O1gml–), 6, Kp111 (O1gml–), 7, Kp24 (O1gml+), 8, Kp71 (O1gml+), 9, Kp75 (O1gml+), 10, Kp88 (O1gml+). Serotype O2 strains were used as controls (lanes 1 and 2). Arrows indicate the low reactivity of anti-gal-I mAb with the LPS of gml+ strains. These results showed that presence of gmlABC in O1 strains correlated with binding of the gal-III specific mAb 5A4. The binding pattern of gal-II and gal-III specific mAbs to the LPS (ladder-like pattern) suggests a modular arrangement of specific subunits. Since gal-II specific mAbs appear to bind to the higher molecular weight fractions, it is likely that gal-II caps gal-III, analogously to gal-I in case of the classical O1 strains (Whitfield et al., 1991). The nature of structural modification encoded by gmlABC in O1 serotype was determined by NMR spectroscopy, sugar and methylation analyses of the O-PS and LPS isolated from strain Kp24 (O1 gml+) (Figure 2A, Table 1) and compared with data obtained for Kp4 (O1 gml–) (Figure 2B, Table 2). For the O-PS of the strain Kp24 (O1 gml+) sugar and methylation analysis of the polysaccharide showed the presence of 3-substituted Galf, 3-substituted Galp, 3,4-disubstituted Galp and terminal Galp (data not shown). Analyses of the Kp4 (O1 gml–) O-PS revealed the presence of 3-substituted Galf and 3-substituted Galp. The complete assignments of 1H and 13C resonances for both O-PSs were performed by interpretation of one- and two-dimensional NMR experiments (Tables 1, 2), including COSY, TOCSY, NOESY, HMBC, HSQC-DEPT, and HSQC-TOCSY. Chemical shift values for the 1H and 13C resonances of galactans were compared with data reported previously (Kelly and Whitfield, 1996; Vinogradov et al., 2002; Szijarto et al., 2016). Figure 2. 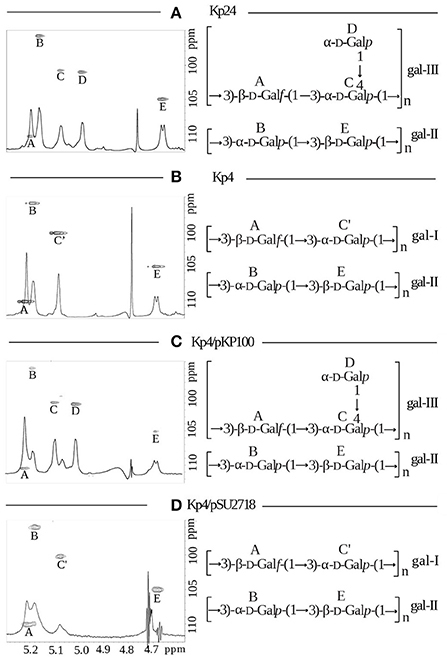 Structural analysis of lipopolysaccharides from K. pneumoniae strains: (A) Kp24 (gml+), (B) Kp4 (gml–), (C) Kp4 transformed with pKP100 (recombinant plasmid carrying gmlABC), and (D) Kp4 transformed with pSU2718 (empty cloning vector). Anomeric regions of 1H, 13C HSQC NMR spectra overlaid with 1H NMR profiles of the isolated O-PS for strains Kp24 (A), Kp4 (B), Kp4/pKP100 (C), and intact LPS for the strain Kp4/pSU2718 (D) (left panels). NMR spectra for the strain Kp4/pSU2718 were acquired using HR-MAS technique at a spin rate of 4 kHz at 30°C. The capital letters refer to carbohydrate residues as described in Tables 1, 2. For each strain O-PS gal-I and gal-II repeating units were shown as inset structures (right panels). Table 1. 1H and 13C NMR chemical shifts and inter-residue connectivities observed for O-PS isolated from K. pneumoniae LPS from strain Kp24. Table 2. 1H and 13C NMR chemical shifts and inter-residue connectivities observed for O-PS isolated from K. pneumoniae LPS from strain Kp4. NMR spectra of O-PS of Kp24 (O1 gml+) indicated the presence of five anomeric signals corresponding to the residues of gal–III (A, C, D) and gal-II (B, E) polysaccharides. Residue A (δH/δC 5.22/110.6 ppm, 1JC-1,H-1 170 Hz) was recognized as the 3-substituted β-D-Galf due to the deshielded furanosic anomeric carbon in β-configuration (δC 110.6 ppm) and high chemical shift value of C-3 (δC 85.7 ppm). Residue C (δH/δC 5.10/100.9 ppm, 1JC-1,H-1 169 Hz) was recognized as the 3,4-disubstituted α-D-Galp due to the large vicinal couplings between H-1, H-2, and H-3 and the small vicinal couplings between H-3, H-4, and H-5 and relatively high chemical shift values of C-3 (δC 77.7 ppm) and C-4 (δC 79.1 ppm). Residue D (δH/δC 5.01/101.2 ppm,1JC-1,H-1 167 Hz) was recognized as the terminal α-D-Galp due to the large vicinal couplings between H-1, H-2, and H-3 and the small vicinal couplings between H-3, H-4, and H-5. Residues B and E were identified as the constituents of gal-II. Residue B (δH/δC 5.19/96.1 ppm, 1JC-1,H-1 180 Hz) was recognized as the 3-substituted α-D-Galp due to the large vicinal couplings between H-1, H-2, and H-3 and the small vicinal couplings between H-3, H-4, and H-5 and relatively high chemical shift value of C-3 (δC 80.0 ppm). Residue E (δH/δC 4.69/105.1 ppm, 1JC-1,H-1 160 Hz) was recognized as the 3-substituted β-D-Galp due to the large vicinal couplings between H-1, H-2, and H-3 and the small vicinal couplings between H-3, H-4, and H-5 and relatively high chemical shift value of C-3 (δC 77.7 ppm). The inter-residue connections between the adjacent sugar residues were observed by NOESY and HMBC experiments. The RUs identified for Kp24 O-PS consisted of the → 3)-α-D-Galp-(1 → 3)-β-D-Galp-(1 → disaccharide, reported as gal-II, and the → 3)-β-D-Galf-(1 → 3)-[α-D-Galp-(1 → 4)]-α-D-Galp-(1 → trisaccharide reported as gal-III, which has been published previously as a glycoform of gal-I in O2 serotype (Kelly et al., 1995; Szijarto et al., 2016). Unlike the O-PS isolated from Kp24, Kp4 (O1 gml–) O-PS contained gal-I structure (B and E residues) devoid of a branching terminal α-D-Galp. Interpretation of the complete set of NMR spectra of Kp4 O-PS, including NOESY and HMBC experiments, revealed the presence of C' and A residues attributed to gal-I RU: → 3)-β-D-Galf-(1 → 3)-α-D-Galp-(1 →, as well as E and B residues attributed to gal-II RU: → 3)-α-D-Galp-(1 → 3)-β-D-Galp-(1 → (Table 2, Figure 2B). The RU structures of gal-I and gal-II were in agreement with previously published data (Whitfield et al., 1991; Kol et al., 1992). To corroborate the exclusive role of gmlABC genes in the immunological and structural difference between O1 gml– and gml+ strains, an isogenic strain pair was investigated. Kp4 (O1 gml–) was transformed with pKP100 (carrying gmlABC) or with the empty vector (pSU2718). Binding of gal-I, gal-II and gal-III specific mAbs to the LPS of these transformant pairs was tested in immunoblot (Figure 3). While mAb 1F11 recognized LPS from Kp4 carrying pSU2718 (similar to the wild-type strain), no binding was detected to Kp4/pKP100 LPS (Figure 3B). In contrast, 5A4 reacted solely with LPS from Kp4 trans-complemented with gmlABC on pKP100 and wild type O2 gml+ used as the control (Figure 3C). These data confirm that gmlABC genes themselves can modify the gal-I subunits of O1 LPS, similarly to the modification of O2 antigen (i.e., O-PS structure as gal-I without being capped by gal-II). As mAb 5C10 (gal-II specific) reacted with both pKP100 and pSU2718 transformed mutants (Figure 3A), the presence of gmlABC shows no effect on the expression of gal-II. Figure 3. Immunoblot reactivity of isogenic gml mutants of K. pneumoniae O1 strain. The wild-type (gml–) strain Kp4 was trans-complemented with the cloned gml operon or the empty vector (as control). Separated LPS molecules were reacted with monoclonal antibodies specific to different galactan structures as shown: (A) anti-gal-II mAb 5C10, (B) anti-gal-I mAb 1F11, (C) anti-gal-III mAb 5A4. Serotype O2 (PCM-27) and O3 (PCM-11) strains were used as controls (lanes 1 and 2). Lane description: 1, PCM-27 (O2gml+), 2, PCM-11 (O3, control), 3, Kp4 (O1gml–), 4, Kp4/pSU2718 (O1gml–), 5, Kp4/pKP100 (O1gml+). O-PS structures of trans-complemented mutants were verified by NMR spectroscopy. Standard or HR-MAS NMR spectra were obtained for isolated O-PS and/or LPS (Kp4/pSU2718 mutant), respectively. For the O-PS of Kp4/pKP100 (gml+) five residues were identified indicating the presence of the disaccharide RU of gal-II, → 3)-α-D-Galp-(1 → 3)-β-D-Galp-(1 →, and the branched trisaccharide RU of gal-III, → 3)-β-D-Galf-(1 → 3)-[α-D-Galp-(1 → 4)]-α-D-Galp-(1 → (Figure 2C). The O-PS of strain Kp4/pSU2718 (empty cloning vector) consisted of gal-I and gal-II (Figure 2D). The structures of O-PSs isolated from Kp4/pKP100 and Kp4/pSU2718 LPS differed due to the presence of α-D-Galp (residue D) in gal-I RUs. Structural analyses confirmed that this modification was dependent on the presence of the gmlABC operon. The vast majority of K. pneumoniae isolates express LPS O-antigens that are homopolymers of mannose (i.e., mannans; O3 and O5) or homopolymers of galactose (i.e., D-galactans; O1 and O2). Among galactans, expression of the structure known as gal-I is associated with serotype O2 (Whitfield et al., 1992), while the same structure capped with the antigenically different gal-II polymer as the outer O-antigen results in serotype O1 (Whitfield et al., 1991; Kol et al., 1992). Recently, based on the correlation of reactivity patterns of monoclonal antibodies with corresponding genetic background, a locus (gmlABC) responsible for the modification of gal-I RU by terminal Galp was described (Szijarto et al., 2016). Structural analysis revealed that the modified structure is identical to that of the O2(2a,2f,2g) subserotype described earlier by the Whitfield group (Kelly et al., 1995). To highlight the structural and antigenic differences, this modified structure has been termed gal-III. Szijarto et al. also showed that expression of gal-III is strongly associated with the KPC-producing epidemic K. pneumoniae lineage ST258 (Szijarto et al., 2016). Interestingly, none of the ST258 strains investigated carried the genetic determinants of gal-II synthesis, hence they were considered to belong to the O2 serogroup. To find out whether gal-III, similarly to gal-I, can be capped by gal-II, strains that carried simultaneously both loci encoding gal-III synthesis (gmlABC) as well as that for gal-II synthesis (wbbYZ), were selected by PCR. Structural analysis of extracted LPS or isolated O-PS molecules revealed the presence of both gal-II and gal-III (Figure 2), suggesting that expression of these structures is not exclusive. This was confirmed by immunoblots showing reactivity to both gal-II and gal-III specific mAbs. Furthermore, based on the staining pattern in immunoblotting (Figure 1), gal-II appeared to cap gal-III, i.e., a modular arrangement similar to that of gal-I and gal-II (Whitfield et al., 1991) is likely. Clinical isolates of the O1 and O2 serogroups represent the absolute majority of all K. pneumoniae strains (Alberti et al., 1993; Trautmann et al., 1997; Hansen et al., 1999; Hsieh et al., 2014). Detection of O-antigen by specific polyclonal sera has been the gold standard for the typing of K. pneumoniae serotypes. Moreover, O-antigens are considered to be attractive targets for active and passive immunization (Rukavina et al., 1997; Trautmann et al., 2004; Szijarto et al., 2016). Thus, it is important to reveal structural modifications of LPS that may influence serotyping and binding of therapeutic monoclonal antibodies. This study corroborated the model for the classification of galactan-type O-antigens proposed previously by Szijarto et al. (2016). The wb cluster encoding gal-I synthesis is indispensable for the synthesis of any O1 or O2 antigens. The gal-I to gal-III conversion, i.e., the addition of a terminal α-D-Gal to the gal-I RUs is encoded by the gmlABC locus in both O1 and O2 serotypes. Finally, gal-II can cap both gal-I and gal-III, resulting in both cases in O1 serotype, in a wbbYZ-dependent manner. Importantly, the functions encoded by gmlABC and wbbYZ appear to be completely independent from each other. Interestingly, similarly to O2 strains (Szijarto et al., 2016), serological data (Figure 1B) shown here indicated non-stoichiometric conversion of gal-I RU to gal-III RU for the wild-type O1 gml+ strains. This was not supported by NMR data of Kp24 O-PS, since the interpretation was provided for the most intense signals and all attempts to identify and interpret additional signals indicating non-stoichiometric conversion of gal-I RU to gal-III RU failed due to the week intensity. Results of methylation analysis did not provide useful and unequivocal information, since derivatives of → 3)-α-D-Galp might result not only from non-stoichiometric conversion of gal-I RU to gal-III RU, but also from both sugars of gal-II RU. We assume that the expected non-stoichiometric conversion of gal-I RU to gal-III RU in Kp24 O1 gml+ strain may be even lower than that for the recently described O2 gml+ strain (~6%), what made stoichiometry tracking difficult. On the other hand, overexpression of gmlABC (upon complementation) resulted in loss of reactivity with the gal-I specific mAb (Figure 3C). This suggests that transcriptional regulation of gmlABC may influence the stoichiometry of gal-I/gal-III ratio. However, since in case of O1 strains both gal-I and gal-III subunits are capped by the serotype determining gal-II polymer, this observation has diagnostic and clinical relevance rather for K. pneumoniae O2 strains. Nevertheless, as O1 O-antigen only occurs as combination of gal-II with gal-III or gal-I polymers, the presence of gmlABC-encoded modification might be relevant, regarding immunogenicity of future vaccine candidates based on O-PS of Klebsiella. KS cultured bacteria, isolated and degraded LPS and O-PS, and contributed to their structural analyses. KS and MK prepared bacteria for HR-MAS NMR studies and analyzed NMR data. KS, MK, and TN performed acquisition of HR-MAS NMR data and optimized parameters. JL designed and coordinated bacterial, LPS and O-PS preparations, modifications, and structural studies and contributed to structural analysis. JL prepared biotinylated O-PS for the selection of monoclonal antibodies. VS designed and performed complementation studies, analyzed genetic, and phenotypic data of bacterial strains. KH isolated LPS from and confirmed phenotype of clinical isolates. JL, GN, and VS wrote the manuscript. VS, KH, and GN were involved in the generation, selection, and characterization of monoclonal antibodies used in this paper. This study was financially supported by Eurostars grant E! 7563–KLEBSICURE. The publication supported by Wroclaw Centre of Biotechnology, programme The Leading National Research Centre (KNOW) for years 2014–2018. VS, KH and GN are employees of Arsanis Biosciences GmbH and hold shares in the company. Results of preparation and structural analyses of O-PSs and LPS consist part of Ph.D. thesis of KS. VS, GN, and JL are inventors in pending patent application related to antibodies targeting a galactan-based O-antigen of K. pneumoniae. Clinical isolates used in this study were kindly provided by S. Melegh, A. Sonnevend, and A. Valverde. COSY, correlation spectroscopy; HMBC, heteronuclear multiple-bond correlation; HR-MAS, high-resolution magic angle spinning; HSQC-DEPT, heteronuclear single-quantum coherence-distortionless enhancement by polarization transfer; LPS, lipopolysaccharide; mAb, monoclonal antibody; NOESY, nuclear Overhauser effect spectroscopy; O-PS, O-specific polysaccharide; PCM, Polish Collection of Microorganisms; PVDF, polyvinylidene difluoride; RU, repeating unit; gal, galactan; TOCSY, total correlation spectroscopy. Alberti, S., Hernandez-Alles, S., Gil, J., Reina, J., Martinez-Beltran, J., Camprubi, S., et al. (1993). Development of an enzyme-linked immunosorbent assay method for typing and quantitation of Klebsiella pneumoniae lipopolysaccharide: application to serotype O1. J. Clin. Microbiol. 31, 1379–1381. Clarke, B. R., and Whitfield, C. (1992). Molecular cloning of the rfb region of Klebsiella pneumoniae serotype O1:K20: the rfb gene cluster is responsible for synthesis of the D-galactan I O polysaccharide. J. Bacteriol. 174, 4614–4621. Goddard, T. D., and Kneller, D. G. (2001). SPARKY. San Francisco, CA: University of California. Hansen, D. S., Mestre, F., Alberti, S., Hernandez-Alles, S., Alvarez, D., Domenech-Sanchez, A., et al. (1999). Klebsiella pneumoniae lipopolysaccharide O typing: revision of prototype strains and O-group distribution among clinical isolates from different sources and countries. J Clin Microbiol. 37, 56–62. Jachymek, W., Niedziela, T., Petersson, C., Lugowski, C., Czaja, J., and Kenne, L. (1999). Structures of the O-specific polysaccharides from Yokenella regensburgei (Koserella trabulsii) strains PCM 2476, 2477, 2478, and 2494: high-resolution magic-angle spinning NMR investigation of the O-specific polysaccharides in native lipopolysaccharides and directly on the surface of living bacteria. Biochemistry. 38, 11788–11795. Kelly, R. F., Severn, W. B., Richards, J. C., Perry, M. B., MacLean, L. L., Tomas, J. M., et al. (1993). Structural variation in the O-specific polysaccharides of Klebsiella pneumoniae serotype O1 and O8 lipopolysaccharide: evidence for clonal diversity in rfb genes. Mol. Microbiol. 10, 615–625. Kelly, R. F., and Whitfield, C. (1996). Clonally diverse rfb gene clusters are involved in expression of a family of related D-galactan O antigens in Klebsiella species. J. Bacteriol. 178, 5205–5214. Martinez, E., Bartolome, B., and de la Cruz, F. (1988). pACYC184-derived cloning vectors containing the multiple cloning site and lacZ alpha reporter gene of pUC8/9 and pUC18/19 plasmids. Gene 68, 159–162. Rukavina, T., Ticac, B., Susa, M., Jendrike, N., Jonjic, S., Lucin, P., et al. (1997). Protective effect of antilipopolysaccharide monoclonal antibody in experimental Klebsiella infection. Infect. Immun. 65, 1754–1760. Trautmann, M., Ruhnke, M., Rukavina, T., Held, T. K., Cross, A. S., Marre, R., et al. (1997). O-antigen seroepidemiology of Klebsiella clinical isolates and implications for immunoprophylaxis of Klebsiella infections. Clin. Diagn. Lab. Immunol. 4, 550–555. Whitfield, C., Perry, M. B., MacLean, L. L., and Yu, S. H. (1992). Structural analysis of the O-antigen side chain polysaccharides in the lipopolysaccharides of Klebsiella serotypes O2(2a), O2(2a,2b), and O2(2a,2c). J. Bacteriol. 174, 4913–4919. Whitfield, C., Richards, J. C., Perry, M. B., Clarke, B. R., and MacLean, L. L. (1991). Expression of two structurally distinct D-galactan O antigens in the lipopolysaccharide of Klebsiella pneumoniae serotype O1. J. Bacteriol. 173, 1420–1431. Copyright © 2017 Stojkovic, Szijártó, Kaszowska, Niedziela, Hartl, Nagy and Lukasiewicz. This is an open-access article distributed under the terms of the Creative Commons Attribution License (CC BY). The use, distribution or reproduction in other forums is permitted, provided the original author(s) or licensor are credited and that the original publication in this journal is cited, in accordance with accepted academic practice. No use, distribution or reproduction is permitted which does not comply with these terms.